Our research is focused on Algorithms for Data Mining and their application to Bioinformatics and Computational Biology. 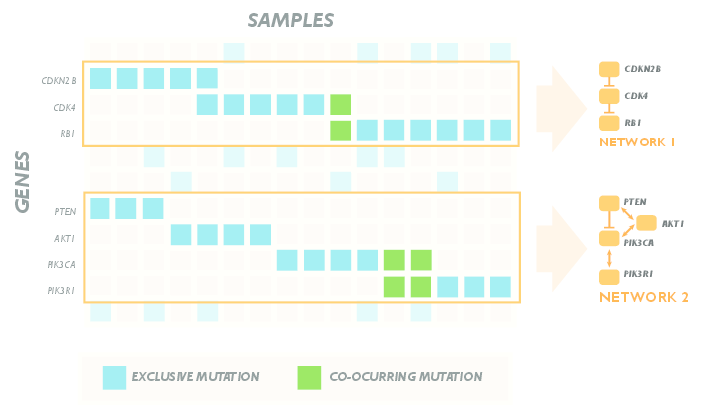 We design computational and statistical methods to solve problems that arise in the analysis of biological data, with a focus on problems involving massive data sets, such as the ones produced by next-generation sequencing technologies. While our primary focus is computational biology, we also work in more general areas of big data analytics, such as data mining and large network analysis. Postdoc positions available! There are 3 postdoc positions (1 or 2 years) available on the following topics: Algorithms for Data Mining; Network Analysis for Cancer Genomics. If interested, send an email (including your CV, publications, and contact information for 2 references) to the address below. Jan. 2019: our work "Efficient Algorithms to Discover Alterations with Complementary Functional Association in Cancer" has been accepted to PLOS Computational Biology! Great collaboration with Rebecca Sarto Basso and Dorit Hochbaum. Dec. 2018: our paper "Fast Approximation of Frequent k-mers and Applications to Metagenomics", led by Leonardo and in collaboration with Cinzia Pizzi, has been accepted to RECOMB 2019! Jun. 2018: our paper "Differentially Mutated Subnetworks Discovery", with Morteza Chalabi and Eli Upfal, has been accepted to WABI 2018! May 2018: two papers accepted at KDD 2018! One, Efficient Mining of the Most Significant Patterns with Permutation Testing, lead by Leonardo Pellegrina, and one MiSoSouP: Mining Interesting Subgroups with Sampling and Pseudodimension in collaboration with Matteo Riondato. Jan. 2018: our paper "Efficient Algorithms to Discover Alterations with Complementary Functional Association in Cancer" has been accepted to RECOMB 2018! March. 2018: our project Algorithms for Inferential Data Mining (PI: F. Vandin; total amount:€ 140,000) has been funded by the University of Padova within the STARS program! Sept. 2017: our project Algorithms for Networks Analysis and Bioinformatics Applications (PI: F. Vandin; total amount:€ 54,000) has been funded by the University of Padova!